3D Printing might still be enjoying the thrills of its infancy, but that can't take away from the feats it has already managed to pull-off. In just a short span of time, 3D printers have already accomplished the production of food, clothing, plastic guns, and a prosthetic face implant for a cancer survivor. And while we're clearly at the cusp of a new and emerging technology, one Dutch architectural firm is already thinking much bigger. It was announced last week that a Dutch group will be attempting to build a house completely on 3D printers. The Amsterdam-based firm, DUS Architects, working from a one-of-a-kind 3D printer known at the KamerMaker that towers close to 20 feet in height, will first develop a 1:20 scale working model for use as the model of the full-sized 3D-printed home. Each section of the home will then be printed in layers, and constructed according to the highly-innovative design plans. Keep in mind that this is more than just ideas on paper, or plastic. Development is already well underway in Amsterdam, and the firm expects to have the front façade of the house done by the beginning of 2014. When completed, it will be complete with study, kitchen, guest and bedrooms, storage and other amenities. According to the designers, the plan is expected to evolve as 3D printing technology continues to make astonishing strides in advancement. 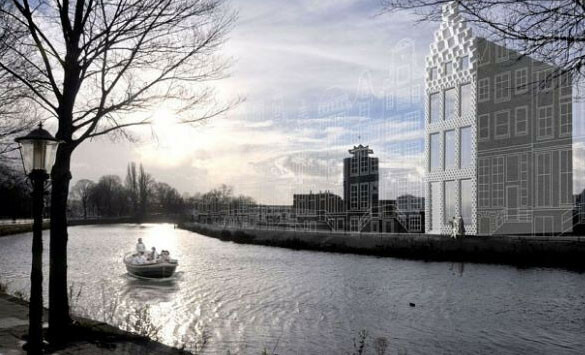 The planned location for the complete 3D-printed house, will be adjacent to the Buiksloter Canal in Northern Amsterdam. One of the primary functions of the printed home, will be to increase awareness of 3-D printing - a field in which the Dutch have clearly established a strong and industry-changing presence.